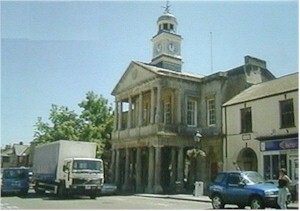 Chard is the highest town in Somerset, standing 400 feet above sea level. It has lovely views from Windwhistle hill and Snowdon hill. Two streams flow along the high street one going north towards the Bristol Channel, the other south to the English Channel. In the year 1234 the town was made into a borough. It had a thriving wool industry, this halted in the 19th century when people turned to making the net which forms the base of machine lace. The 16th century court house, really a group of several Elizabethan houses, is Chards most interesting site, and the church of St.Mary has a 17th century monument of William Brewer a local doctor and his family.